I won't hold back here - I am super freaking psyched about this particular Limited Edition - Missha X Minions is probably the one collection which I did not hesitate for a second to get my hands on! 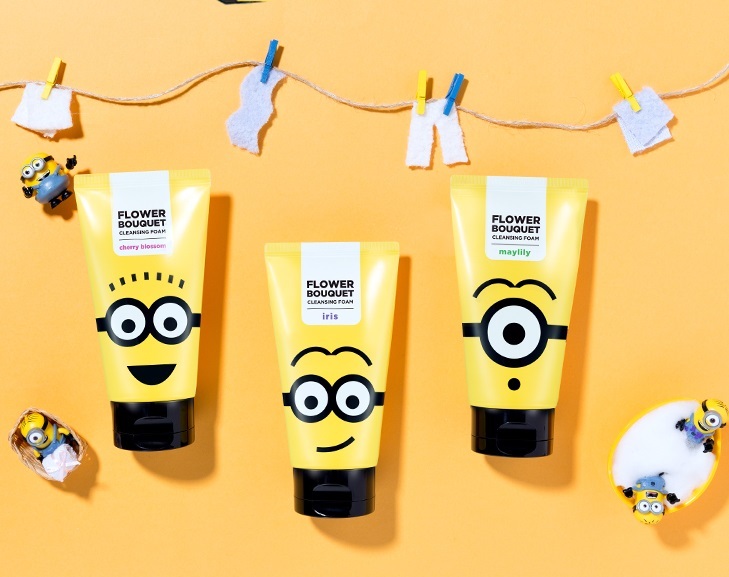 So, when I saw this collection I freaked - Minions are beloved characters, put them together with Kbeauty and you have an irresistible item. I saw there were two eyeshadow palettes, and at first I had high hopes - only to be quite let down when I saw the shades. The palettes are both neutral quads. Which is just such a disappointment, because Minions ought to be represented with bright, bold shades. I really did expect a blue/yellow combo, or at least something slightly more colourful than what they put together. Then came the Flower Bouquet face washes - I did consider getting one, but I currently have 3 facial cleansing foams and simply could not justify getting yet another one (just yet). And now for the Magic Cushions - there are two different kinds. Unimpressed Stuart is the Moisture type, and Happy Dave is the Cover type. By a stroke of luck both the packaging and the formula that I wanted came together! Stuart is the Moisture kind - I really like that formula, and the packaging for Stuart is just ridiculously cute (and funny). Obviously, I got it! I mean, look at that face! I also picked up the Cushion Lip Crayon in Dave [RD01] - a cool-toned cherry red that's an absolute bomb! 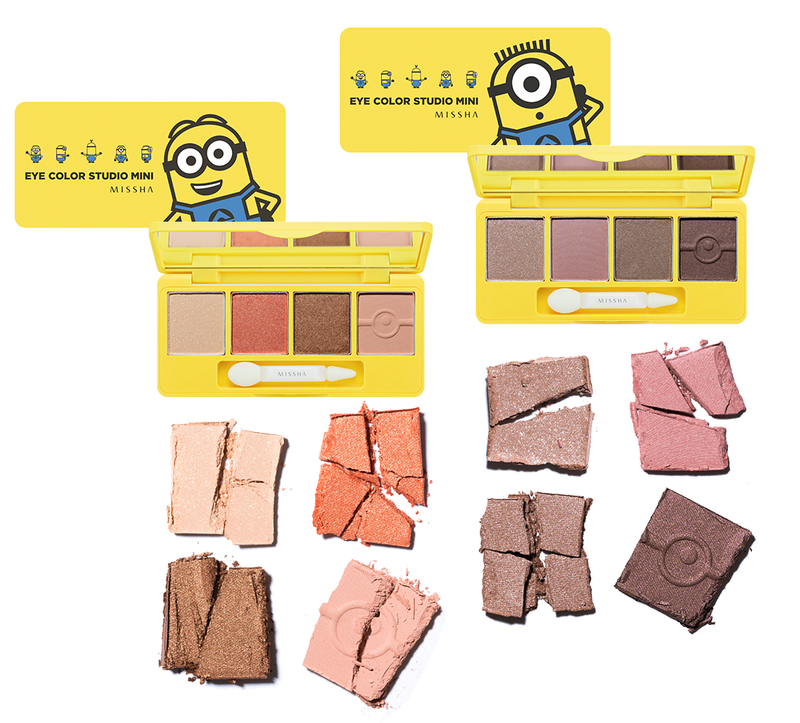 I got the same shade for my sister, to share a bit of the Minion love. 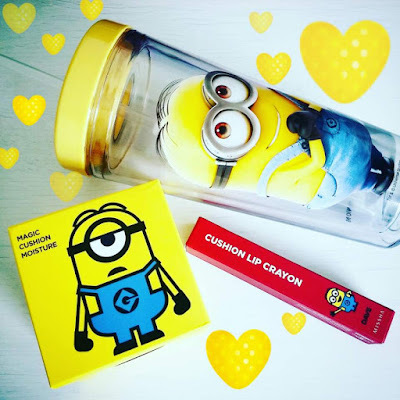 The cold cup, that was a special offer when you bought any of the Minions makeup, is just the proverbial cherry on top - it's adorable, not spill-proof, but sturdy and comfortable to drink from. Oh, who am I kidding?! Minions!! Now, please excuse me, but I do fully intend to cover my blog with Minions this week. The review of Magic Cushion Moisture [Stuart] will come out tomorrow, and the Cushion Lip Crayon [Dave] will follow on Thursday. Want to dip your toes in earlier? Follow me on Instagram for mini-reviews! Don't forget that you can get your hands on these too! Both Jolse.com and BBcosmetic.com have the full collection (including the cold cup).